Create a wall calendar with photos on the top half, and your calendar grid below. We can print on a 12 x 18" sheet, folded and trimmed to an 8.5 x 11, so your photos can extend to the edges of the sheet (called full bleed) when your calendar is trimmed. The example above center was printed for Kennesaw State's Theatre program recently. 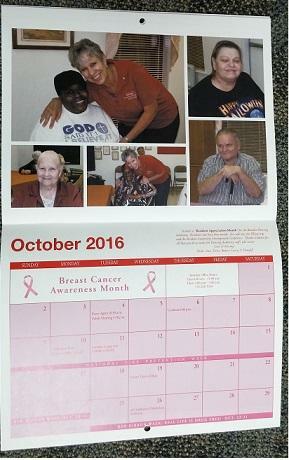 Above left, Carroll County's Bowdon Housing Authority. Another option is a large, flat wall calendar. 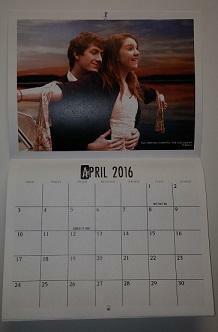 Those we produce look very similar, although this particular calendar isn't one of ours. 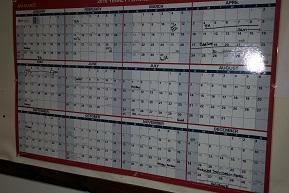 Pub & Print can also apply a dry-erase laminate so that you can write on your wall calendar.